Recently EV News had the opportunity to test drive two electric vehicles with 500 km range within a fortnight of each other. One, a Tesla Model S P85+ and the other a world record breaking electric car, the University of New South Wales Sunswift eVe solar race car. I wrote last year how in many ways the two share a common heritage with technology in the Tesla having a direct evolutionary path from the inaugural World Solar Challenge in 1987. While I was massively impressed by my short drive in the top-of-the-line Model S, it's interesting to analyse the strengths and weaknesses of two EVs that both achieve the holy grail of plug-in vehicles, 500 km range on a single charge. Following Sunswift eVe's World Record run in July, Wired magazine hailed the student-run university project as Tesla's new competitor, ahead of the likes of BMW or General Motors. Hyperbole? Perhaps as eVe is not a road registered vehicle let alone production ready. But that doesn't detract from the fact that during the world record run, Sunswift eVe achieved 500 km range at highway speeds of 107 km/h (66 mph), sans solar array charging, with a battery pack made of the exact same Panasonic cells used by Tesla but with 1/5 th the capacity of the Model S.
Taking into consideration that much of the Model S design, from the large wheelbase to the all aluminium body construction, is dictated by the 500 km range goal and the size and weight of the battery pack required to achieve that, any vehicle with energy efficiency high enough to reduce the 18650 lithium-ion battery cell count from 7,104 to 1,200 must offer some advantages. Number one on the list is direct drive in-wheel motors. Sunswift eVe is rear wheel drive powered by 2x 1.8 Kw (10 Kw Peak) Australian developed direct drive CSIRO wheel motors that give eVe a top speed of 140 km/h. 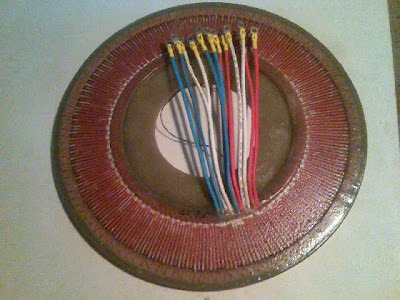 The axial flux BLDC wheel motors are 98.3% energy efficient and because the permanent magnet rotors are integrated directly into the wheel rim there are no gearing losses that typically reduce energy efficiency at the tires by 20-30%. Sure, rated power of only 1.8 kw is barely enough to run a 4 slice toaster but the driving experience, at the HART facility in Sydney's northern suburbs during a sponsor day, demonstrated that 20 kw peak (27 horsepower) provides enough performance to accelerate and maintain highway speeds with minimal fuss. Each wheel motor weighs in at only 15 kg with the Australian developed 99.2% efficient Tritium WaveSculptor22 motor inverters adding less than 1 kg each to over-all powertrain weight. Next up is aerodynamic efficiency. Because the car was deigned for a 3,000 km race with a high average speed on extremely limited solar power, aero efficiency is king. 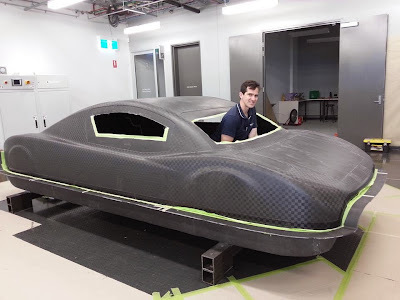 Sunswift eVe has a 1800 x 4500 mm footprint (larger than a Tesla Roadster) and although the car has twice the frontal area of its blade-like solar car predecessor, Sunswift has achieved a similar drag coefficient. It’s managed this partly through a unique high-set “tunnel” underside design, giving the car the look of a catamaran. 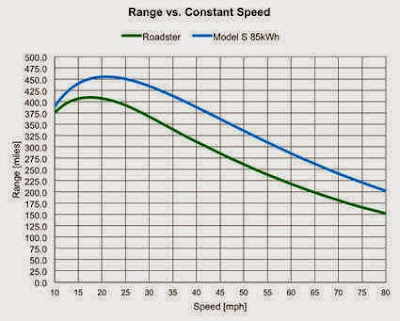 Tesla claim a 0.24 drag coefficient for the Model S which is the lowest of any production vehicle. The Sunswift team went through 50 design iterations over 3 months using Computational Fluid Dynamics (CFD) simulation to achieved a Cd of 0.16. During my test drive of eVe, even though the vehicle had both doors removed for easy access, the lack of aero drag seemed noticeable while coasting. One team member told me it takes eVe several kilometers to coast to a stop from 100 km/h. While the Model S monocoque is entirely aluminium, every panel on the Tesla Roadster was carbon fibre and UNSW has taken that a step further and fabricated the entire chassis from the material. Manufactured through a sponsorship deal with New Zealand firm Core Builders Composites, the company that built much of the America's Cup fleet, the vehicle has a kerb weigh of just 320 kg. A Tesla Model S weighs 2100 kg. The main benefit of light weight when at constant speed is reduced rolling resistance. Approximately 5–15% of the fuel consumed by a typical car may be used to overcome rolling resistance. Sunswift eVe uses Michelin special order low rolling resistance tyres which are run at 80 psi. While not exactly the same kind of road car tires as the 285/30 R21 at the rear of a P85+, they are possibly not too far removed from the bicycle like 155/70 R19 tires fitted to the BMW i3. The combination of zero mechanical transmission losses, high electrical energy efficiency, low aero drag and rolling resistance means a 16 kWh battery made from 1200x Panasonic NCR18650 cylindrical Lithium Ion cells, with a pack weight of only 63 Kg, is enough to give eVe a single charge highway speed cruising range of over 500 km. That's the same battery capacity as a Mitsubishi iMiEV which has a maximum range of 155 km or a Volt which achieves 70 - 80 Km in EV mode. The combined range for Sunswift eVe with it's 800 watt solar array connected is 800 km (500 miles). Although carbon fiber is roughly 20 times more expensive than steel, BMW believe it is the future of electric vehicle production and have invested €400 million to launch the first carbon fibre reinforced plastic (CFRP) production car, the all electric i3. BMW’s goal is to get the expense of a carbon-fiber frame down to the level of aluminium by 2020. While only the passenger cabin of the i3 is made from carbon fiber with the drive train, battery and suspension attached to an aluminium chassis, it seems only a matter of time before 100% CF chassis like eVe become economically viable for mass produced road cars. 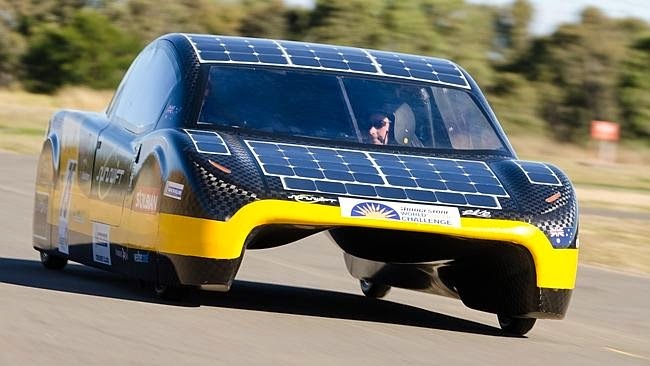 The next challenge for the Sunswift team is to make eVe the first road-legal solar-powered car in Australia. They expect it to meet Australian road registration requirements within as little as one year.